European and Americans who have sailed on the cruise line's intimate, upscale ships love the line for its social atmosphere and Mediterranean and exotic itineraries. Created in 1988, Ponant is based in Marseilles, France. Originally French-owned and, at one point, aimed almost exclusively at the French market, the company was acquired by cargo giant CMA CGM in 2006, then sold on to pan-European private equity investor Bridgepoint Capital in 2012. Over the past few years, and particularly with the launch of its three new ships, the line has been targeting a more international market with considerable success. The essence of the product, though, remains unchanged under the new owners, with a family-run feel and a strong French influence throughout the ships. Beyond its French base, Ponant has been successful in attracting travelers from North America, the U.K. and continental Europe, and, in early 2014, kicked off a program to market its cruises to Australians and New Zealanders. The line is dedicated to soft adventure cruising; in season (December to March), half of its fleet is based in Antarctica. 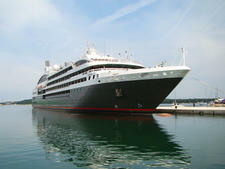 It also offers offbeat itineraries around the world, especially in the Mediterranean, Asia and the Caribbean. 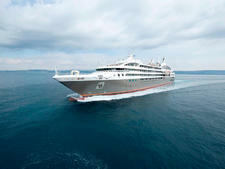 Launched in 2011, L'Austral was the second in a series of 264-passenger, ice-strengthened cruising yachts commissioned by Ponant; it's also often chartered by other lines such as Tauck. 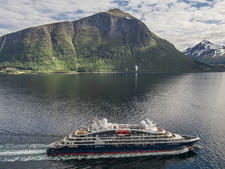 Ponant's fleet of four virtually identical 264-passenger ships, Le Soleal, Le Boreal, L'Austral and Le Lyrial, offers an elegant, relaxed, yacht-like atmosphere onboard without losing the comforts of a cruise experience. Most cabins have balconies, and each ship has two restaurants, three lounges, a library/card room, an Internet nook, a spa and a fitness facility. About the only thing these four vessels don't have are casinos. The 64-passenger Le Ponant, built in 1991, is a three-masted sailing ship. It sails some of the company's most exotic itineraries. Whichever ship you choose, expect intimate onboard spaces that inspire a congenial atmosphere among guests. The crew offer personalized service. Because this is a French cruise line, European cuisine is a hallmark of the experience (though on charters to U.S.-based travel companies, menus might be tweaked, slightly, to accommodate American tastes). One difference between Ponant's cruises and those of other upscale lines is that pricing is more a la carte. You could pay extra for shore excursions, cocktails (unless a drinks' package is included in your fare), gratuities and other services, depending on where you buy your cruise; the policies vary for U.S., U.K., French, German and Australian customers, so it can be confusing. Wi-Fi is complimentary. 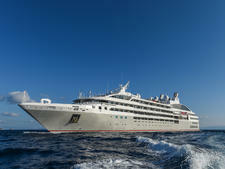 The line's a la carte fares, though, are competitive for its upmarket niche, so Ponant's value-for-money ratio is high. Ponant attracts a mostly French clientele, with a healthy mix of other Europeans and a sprinkling of Americans. Full-ship charters through Tauck, a Connecticut-based travel company, or Abercrombie & Kent, tend to have mostly North American passenger rosters. On these cruises, travelers tend to be 50-plus, well to do, well traveled and interested in engaging with the destination. 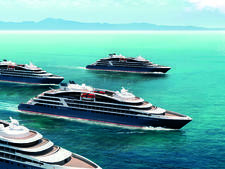 Ponant's fleet consists of six vessels. The 64-passenger Le Ponant, which debuted in 1991, is a three-masted sailing ship. Four identical new-builds debuted in 2010, 201, 2013 and 2015. The 264-passenger Le Boreal, L'Austral, Le Soleal and Le Lyrial, respectively, are state-of-the-art cruise ships, featuring all-outside cabins, 95 percent with balconies. The line plans to build four 184-passenger expedition ships; Le Laperouse was the first to debut in 2018. The 429-foot-long ships have 92 cabins and be Ice Class rated for polar expeditions.